We often commemorate the happy occasions in life such as engagements and weddings with the giving of rings, but we rarely do the same upon the death of a family member or friend. This is despite the tradition of mourning rings dating back to the 14th century. The fact is, until the Victorians turned mourning into an art form which demanded solemnity and and an obvious display of grief, a celebration of the departed’s life was far more common than it is now. The wearing of a mourning ring in commemoration of someone still occurs today, albeit not to the same extent that it once did, but the process of acquiring the ring has certainly changed. In the early days of the rings, they were often paid for by the deceased prior to death, and bequeathed in a will to a strictly controlled list of people, usually close family or friends. Today, it is more common for individuals to purchase the ring themselves, and wear it as a private tribute to a lost loved one. The style of mourning rings has also changed over the centuries, although many different types of design are used today. Originally, it would have been a fairly plain band inscribed with the name and perhaps the date of death of the person. These became more ornate over time, and may include precious stones or be made from different materials for greater effect. Through the 19th century, mourning rings began to include a picture of the deceased, still with the name of the person around the band. 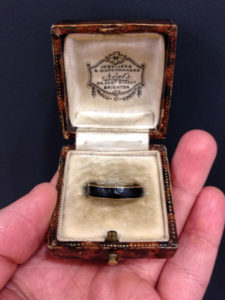 The practice of mourning rings largely faded out in the mid-to-late 19th century, as Victorian society deemed such things to be crass and immoral, and it took nearly 100 years for it to be removed in any meaningful sense. In the 1930s and 40s, mourning rings made something of a comeback, as people started to shake off the shackles of enforced mourning, and viewed a life as more than just a reason to show grief. The material largely used at the time was Bakelite, as plastics were becoming widely available and easily moulded. 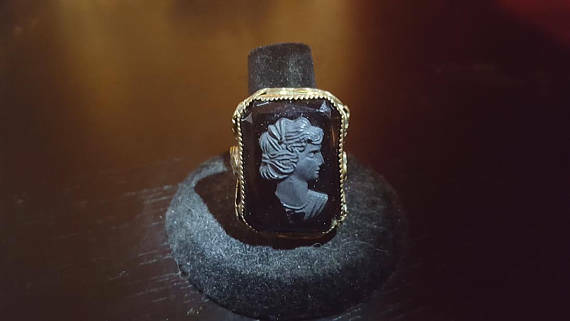 This is possibly an indication that mourning rings have long been seen as a very distinct and separate genre of jewelry design and manufacture. To confirm the lack of fixed rules surrounding the design of mourning rings, they can be found in many different guises. Some are like lockets, which open and often have a lock of the deceased’s hair carried within. As well as paintings or etchings of the individual, other symbols of love would often be used to illustrate the bezel such as flowers or even snakes, which had come to symbolize eternal life. Many mourning rings were colored black, or had black enamel or other elements but, if the death was that of a child, the ring would be white to indicate purity. Should a parent and child die close together, the rings would often be a combination of black and white to show the eternal joining of the two. 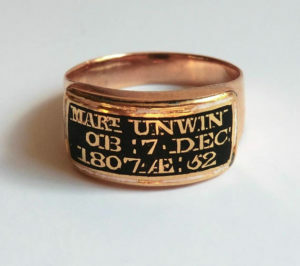 Until even as recently as the mid 20th century, funerals were often only attended by men, and it is to them that the rings were usually presented. However, many men presented the rings to wives or mothers afterwards, if it was a husband or child. Although primarily the reserve of the wealthy during much of their history, mourning rings can now be bought by anybody. Laser engraving has made the creation of bespoke rings much less expensive than they once were, and so they are once again gaining popularity.